PRAGUE, CZECH REPUBLIC—The Czech Republic is one of the most successful members of the former Soviet Empire. Yet Czechs with whom I recently spoke fear liberty is in retreat. The former Communist Party might reenter government after elections later this month. 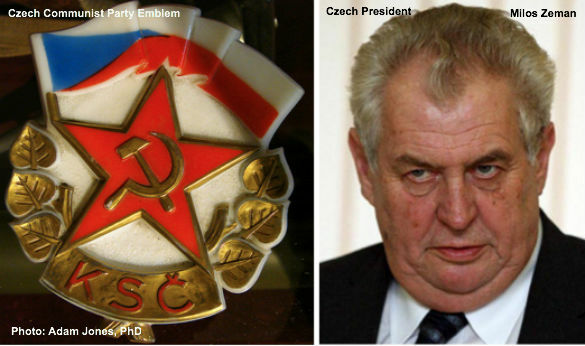 Czechoslovakia was “liberated” by the Red Army at the end of World War II. Communist reformers attempted to inaugurate “socialism with a human face” in 1968, but that triggered Soviet military intervention. After the Berlin Wall fell on November 9, 1989, the so-called Velvet Revolution ousted the Czech Communist Party. Czechoslovakia soon adopted wide-ranging free market economic reforms and split into the Czech Republic and Slovakia. In March, Milos Zeman became the country’s first popularly elected president. Since then the former Social Democratic prime minister has roiled Czech politics by claiming ever more expansive authority. Most dramatically, after the prime minister’s summer resignation President Zeman appointed a leftist government against the wishes of the parliamentary majority. The new cabinet lost a vote of confidence, but remains as caretaker until the upcoming election. Analysts disagree over whether President Zeman is merely pushing the outer bounds of constitutional interpretation or actually breaking the rules. However, the public appears less concerned about the latter’s political maneuvers. Equally controversial are the president’s policies. For instance, he reversed course on the EU after appealing to supporters of his predecessor, the Euro-skeptic Vaclav Klaus, during the presidential campaign. Once in office President Zeman signed the European Stability Mechanism, the EU bail-out fund, advocated common European fiscal, tax, foreign, and defense policies, and supported adopting the Euro as the Czech currency. The greater worry is the revival of the Communist Party. As memories of Communist repression fade, some Czechs long for the perceived stability of the past. The party’s revival is particularly incongruous because the Communist Party of Bohemia and Moravia, or KCSM, remains largely unreconstructed. In fact, it is the only Communist Party in Eastern Europe which still unashamedly calls itself Communist. In 1996 the Party called its 40 year rule “one of the greatest periods of social and economic growth.” Two years ago the KCSM offered its condolences to North Korea after the death of dictator Kim Jong-il in 2011. The Party has benefited from the collapse of the Civic Democratic Party (ODS)—the leading party on the right since it was founded by Klaus more than two decades ago. Polls put it and former coalition partner Tradition Responsibility Prosperity 09 (TOP 09) at under 20 percent combined. Scandal forced out ODS Prime Minister Petr Necas in the summer. Moreover, the Czech Republic has only begun to recover from a recession stretching back to 2011. The KCSM holds 11 percent of the seats in the Chamber of Deputies, the highest share for former communists in any European parliament. With the Social Democrats receiving close to a third and the Communists topping 20 percent in polls for the upcoming parliamentary election, the new government could involve either formal coalition or informal cooperation between these two parties. However, President Zeman might derail this simple outcome. Once a Social Democrat, he has established the Party of Citizens’ Rights Zemanovci (SPOZ), which appears likely to pass the five percent threshold and win seats in parliament for the first time. Other possible entrants include the Christian Democrats, the Greens, and a new party, Action of Dissatisfied Citizens 2011 (ANO 2011), established by billionaire entrepreneur Andrej Babis. The more divided the upcoming vote, the more complex the process of forming a government. The Czech Republic’s future obviously is up to the Czech people. Nevertheless, they should ponder carefully before entrusting their future to the party which so badly failed them in the past. Whatever the question, it is hard to imagine the Communist Party to be the answer. Submitted by uU5ihCKKhr (not verified) on Tue, 10/08/2013 - 13:09. This is so disheartening to hear. Prague is such a beautiful city and its people were so proud to be out from under Communism. It seems such a shame they would forget the repression they once experienced. America is on its way to the same repression and its citizens are either too young to remember the dangers of letting this happen, indifferent or indoctrinated. Citizens of the world need to constantly strive for their freedom, which many Americans are now fighting to keep. May God be in control.